And what a Primal Woods Pure Michigan Maple Syrup season it was! It probably included the biggest changes we will ever take on in the Sugaring business; production was up roughly 8X on 2017, and virtually everything in the process was new, or dramatically scaled up from prior years. If you have read this blog for any period of time, you know that I “reflect” fairly regularly on “what went well” and “what didn’t go so well,” with a keen eye on the latter, because the problems represent the bulk of the opportunity for future improvements. This post will be no exception. Having said that, without question, the most fulfilling, satisfying, and fun part of the 2018 season, was that we were able to involve a lot more of our local community in the process. Before I get to the details, I want to take a moment to acknowledge the contribution of the people who helped us so greatly. Sam, not his best side! Sam Ewbank: Sam did all of the hard work related to the Sugar House conversion project. A new door and window, insulation, drywall, and the roof penetrations for the smoke and steam stacks. Sam embodies everything you like and want in a carpenter. In the picture Sam is working on the roof penetration for the Arch smoke stack. 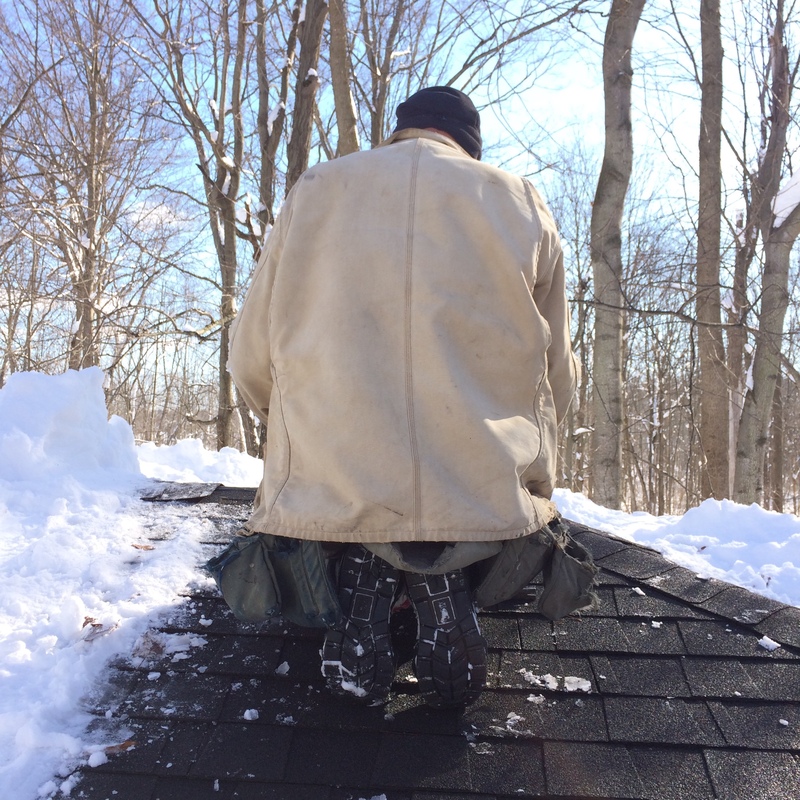 I hate roof penetrations, so I asked a pro to help. Gene Feid and Thomas “Tommy” Smith: Gene and Tommy have done all of our electrical work since we took up a place in Michigan in 2013, and the Sugar House conversion is now included on the list of all of the ways they have helped us. All new wiring for the Sugar House, switches, outlets, power to the Inferno arch blower and the Marcland Max auto draw-off controller, and a separate power meter to measure the needs of the Sugar House and associated equipment. They also designed and installed the plumbing from the sap storage totes to the Leader Evaporator, and took on other jobs big and small, too numerous to mention. 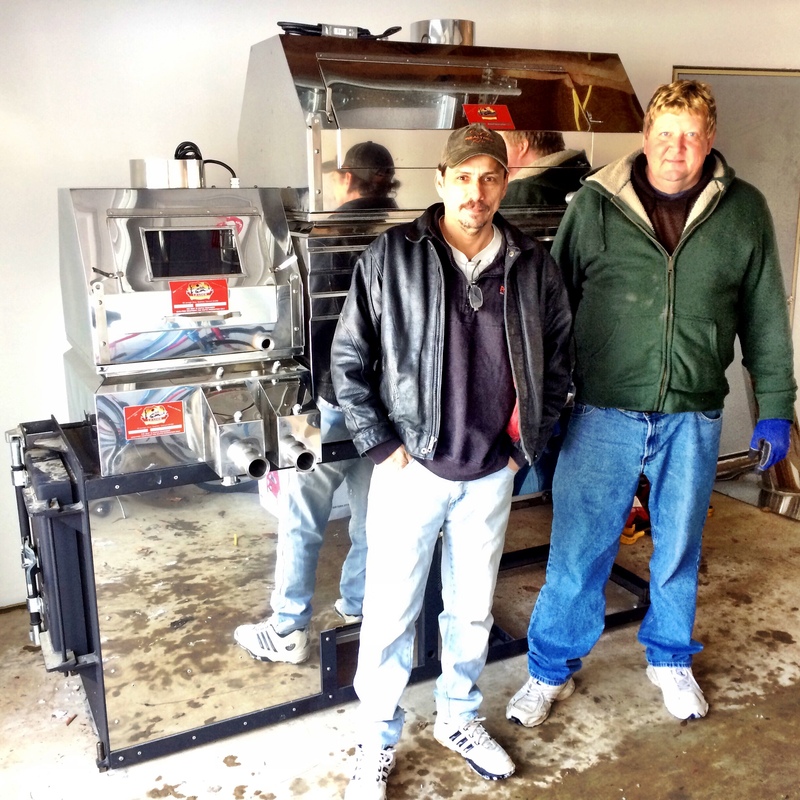 Mary and Josh at Sugar Bush Supplies, Kevin at Leader Evaporator: Most of the new equipment, certainly the bulk of new investment, was manufactured by Leader and distributed and supported by Sugar Bush Supplies in Mason, Michigan. Pretty much everybody would tell you that I desire a lot of “hand holding” when starting something new, and most of the equipment in and around the Sugar House for 2018 was new. 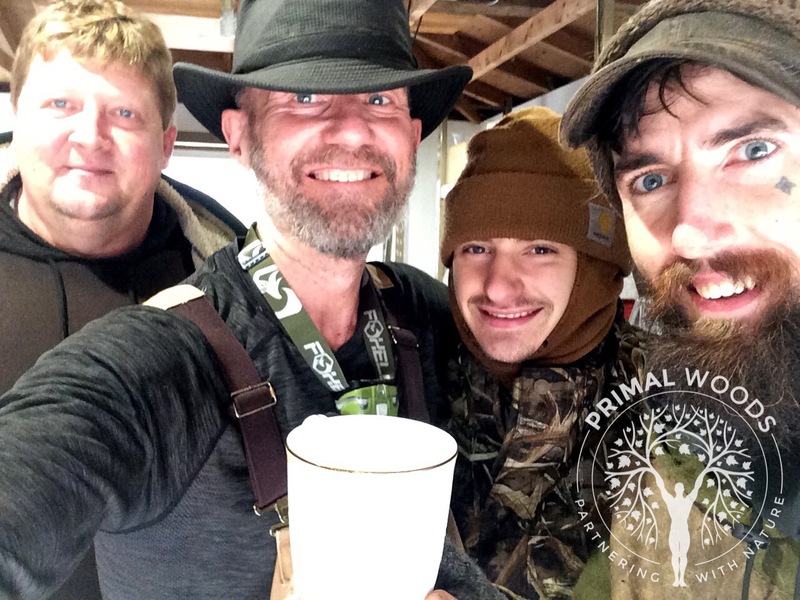 These three answered all of the myriad questions I had, came to Primal Woods for the “first boil” in the new evaporator, gave me the benefit of their many years of experience, and, when things turned turtle, as they will occasionally do, had my back. I could not ask for better support. Joey Kelemen and Kimberly Martin: Joey in the field, Kimberly in the Sugar House, pretty much from Day 1. Tapping, collecting, bottling, and since season-end Joey has also supported me in the portable sawmill service business. Neal Den Haan: Bailed me out with cold storage for concentrated sap; this saved several gallons of syrup when it became to warm for too long mid-season. 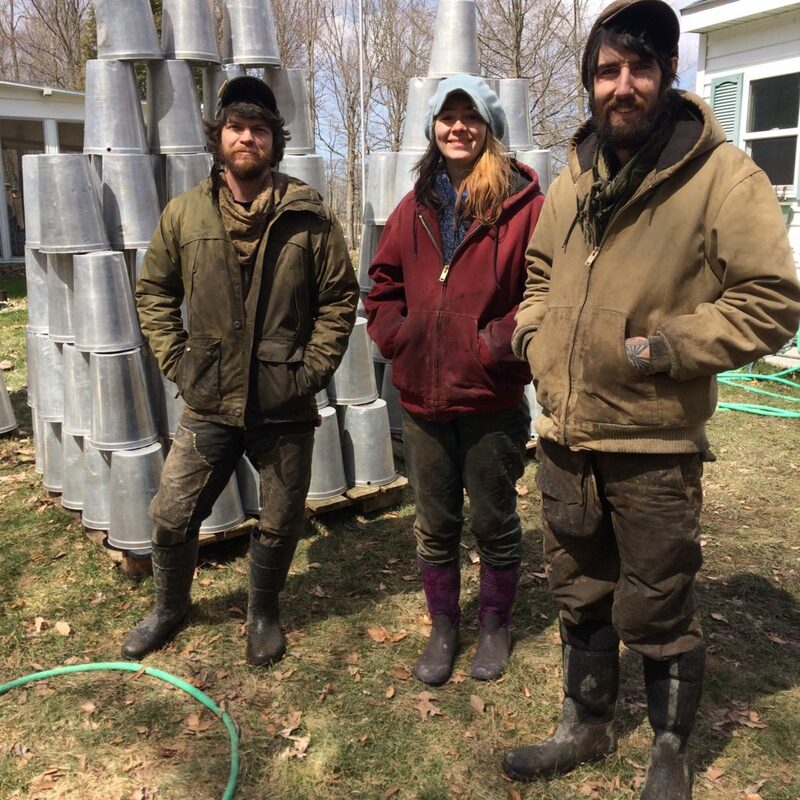 Carl Martin, Jonah Grumbine, and Shiela Casey (pictured at top of the post): If sap was flowing and the evaporator was in operation, these three were there. What can I say. My first rule is that you have to show up, and on time; blame it on my military experience. And it’s no different when running a business; if you can’t be bothered to show up on time, you’re probably going to spend a lot of your time unemployed. Not these folks; on-time, every time. They are also the type of people, that when done doing whatever it is you’ve asked them to do, naturally look around for something that needs doing, and do it. Carl and Jonah spent the bulk of their time collecting sap, transporting it to the Sugar House, pumping it into the storage totes, and when they saw that the head tank was getting low, filling that too. Sheila spent most of her time in the Sugar House, filtering and bottling syrup, dressing the bottles with labels and hang tags, cleaning up the place, and generally keeping John (me) on-task while doing her own work. And at the end of the season, they all helped with the clean-up. Godsend is not too strong a word to describe what Carl, Jonah and Sheila were to Primal Woods, and to me personally, during the 2018 season. I thoroughly enjoy having all of these people around me, and I feel truly blessed to have had more of that opportunity present itself in the 2018 Primal Woods Pure Michigan Maple Syrup season. As documented in the mid-season and late-season updates, a quality problem with a filter press part caused issues in the early season. The problem was identified and corrected. Sap systems: The biggest problem was freezing of piping between the storage totes and the Sugar House. 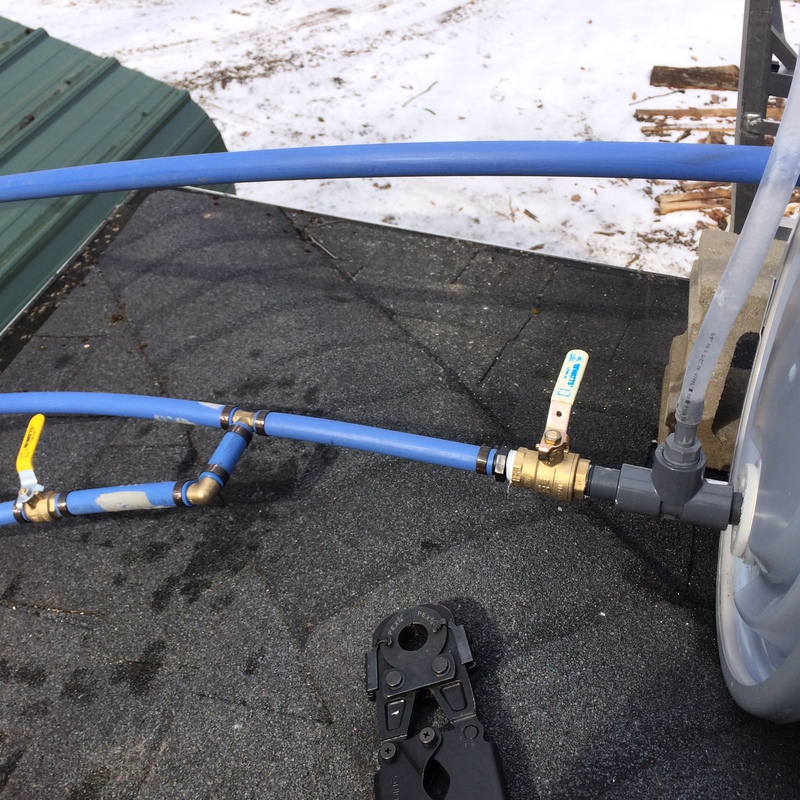 As the season progressed I purchased and used immersion heaters in the storage totes ($ in equipment and energy) and heat tape ($ in equipment and energy) to prevent freeze-ups, and I also incorporated drains in some lines. These “interim solutions” prevented down-time in the second half of the season. However, I would rather not use energy to prevent freeze-ups, so for 2019 the sap transfer systems will have to be of better design to prevent freezing, and to eliminate the need for electrically powered heating. Run-off water management: Simply due to the location of the Sugar House, and the grade it sits on, water tends to accumulate in front of the Sugar House, and if it gets high enough, fed by either rain, snowmelt, or both, the water runs under the door and through the Sugar House. We dug a small trench around the south side of the building which reduced but did not eliminate the problem. Noise: The air compressor for powering the syrup pump, and the syrup pump itself, are very noisy. The noise is a significant distraction. Intent for 2019 is to move at least the air compressor out of the Sugar House. Build-up of scale in the syrup pan: As water is evaporated off of the sap, a point is reached at which some of the mineral content of the sap can no longer be held in solution. The minerals then precipitate out of the concentrated sap, and accumulate, adhere to, the bottom of the syrup pan. 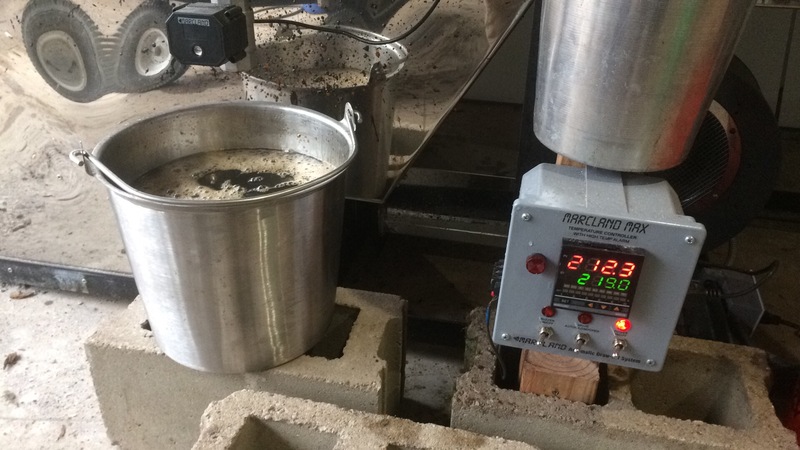 Some of the scale is loose, and enough scale formed that it disrupted the draw-off, which in a worst-case scenario could cause overheating of the syrup pan and burning of the syrup. Equipment cleaning: Several pieces of equipment, including the pre-filtering tank (approx. 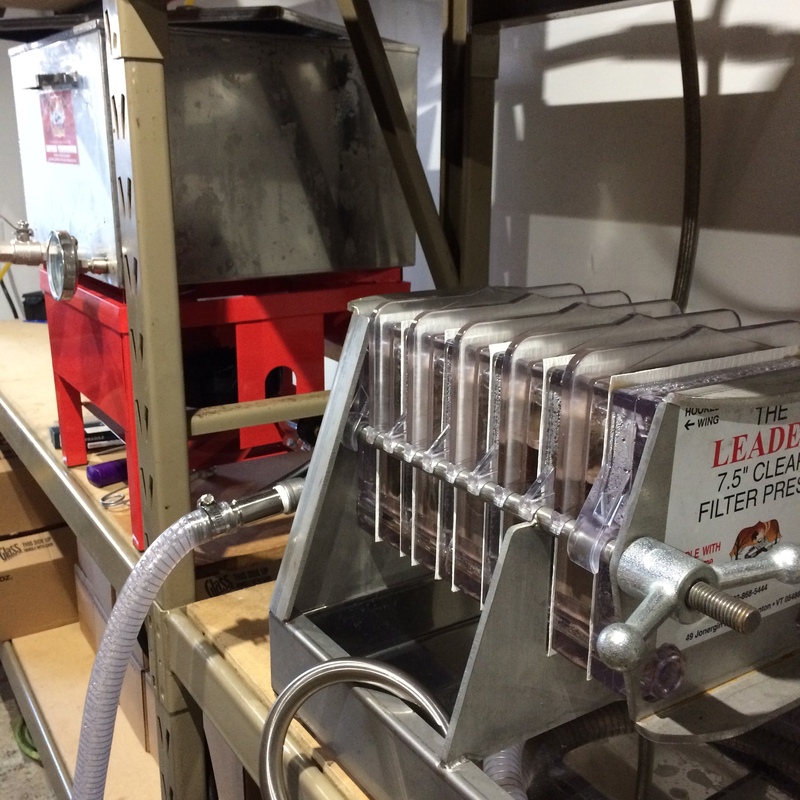 7.7 gallons capacity), the filter press, and the canning unit (approx. 11 gallons capacity), require regular cleaning. The Sugar House is not currently equipped with a deep sink and hot/cold running water, so those parts need to be removed from the Sugar House for cleaning. Propane management: There are three propane fired burners in the sugar house, and the line from the propane tank can only accept two connections. Basically this means there are four hoses loose on the floor, three from the burners, plus one from the tank, and connections are having to be made and unmade during the filtering and bottling processes. A hard-pipe propane manifold serving all propane consumers is under consideration. Firewood: My fault entirely. We did not have enough on the ground early enough, and what we did put in place was green, wet, rotting, or some combination of all of the foregoing. We probably burned through twice as much wood as we should have. Shame on me! Problems are easy to recognize, harder to admit perhaps, but easier to recognize. Still, it is important to also have an eye on what went well, and to develop processes and systems to ensure that the successes are perpetuated. As discussed at length above, The People. The weather. At early and mid-season, I’ll be honest, I thought the season might be chalked up as a “loss.” But, the nor’easters on the east coast caused cold air to be pushed down on us late in the season, saving our production. During the final two weeks of the season, we evaporated ten days, and produced 2/3rds of the year’s syrup. Once the bugs were worked out, and operator error rectified, the evaporator and fitler press worked almost flawlessly. In the face of the “newness” of virtually everything and everybody, we did not fail to make syrup of even a single drop of sap that made it to the evaporator. Despite problems, the sap systems got the job done. The Marcland Max auto draw-off: I can’t imagine having been successful without it. Worked perfectly, perfect sugar concentration in the syrup. Every time. For 2019, it is my intent to double production again. You will be able to read all about what that will entail later this year. We will go to 1,000 taps, which should yield between 200 and 250 gallons of syrup, the equivalent of between 3,200 and 4,000 8oz. bottles. This year we have made 1,573 bottles to date, and I have enough concentrated sap in cold storage to get us to 1,600 bottles and beyond, which would be just north of 100 gallons of syrup. If you would like to help us get there, lay in a good supply of Primal Woods Pure Michigan Maple Syrup for yourself! Visit our Shop. Great wrap up John! I love the way you celebrate people. Thank you David. The people were without doubt the highlight of the year. Building on that is sufficient justification for a sustainable business growth plan!